Going about painting areas throughout your house, should be planned to reduce the amount of disruption and the total time and effort it takes for the painting project. Setting up a temporary storage reduces the amount of lifting and setup of single and five gallon paint containers, ladders and equipment where climbing stairs is involved. Patch walls that are deepest first, since patches of greater depth require longer dry times. Marking the patches as you proceed with blue tape helps track the marks as they become less conspicuous. Have any curtains and drapery pulled for professional cleaning. Replacing after the painting has been completed. As a rule, paint the trim before the walls, masking with blue tape after the gloss-trim painted moulding is dried. Caulking joints and cracks and puttying over nail holes. Countersink the nail holes where needed. 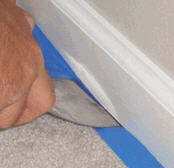 Following the sanding of wall patch, remove wall fixtures, plates and covers. Dropping them into a plastic bucket will keep them organized. Brush the wall trim before rolling. For paints with a sheen, or those sensitive to the effects of flashing, maintain a wet edge between the brushwork and the rolling. This will minimize the overlap or "picture framing" effect. 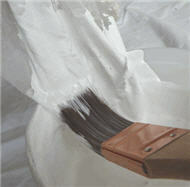 Prior to pulling the masking, see that the desired coverage has been achieved. A large portion of the time and effort is in masking and, once removed, the same lines will rarely be gotten. When determining the rooms in need of painting, view not just the walls and trim and doors, but the ceilings as well. Normally, work the area top-down. When the ceilings are coated before the walls, flat latex dries quick and so keeping the room covered in drop cloths or plastic helps eliminate a seperate covering stage for painting the walls. The trim, if dry time is needed, can quickly be covered with a drop cloth or runner (a narrow drop cloth) as the paint is applied. Typically, moving the furniture toward the center of the room works well, for standing paths to work from and for covering the furniture. Doors can be painted seperately from their jambs - door hardware is removed for the cleanest finish, and once removed the doors should stay unshut.